We’re now going to see how to create some of our game objects like ennemies and our platformer hero. We will also see how to implement a simple collision mechanism between them. You’ll find a live working sample at the end of this article. It’s the base of a simple game. Our Monster object is defined inside Monster.js and takes the BitmapAnimation object as its prototype which has to be used indeed for such scenarios. It contains everything we need: a tick() method, some hit testing mechanism for our collisions and a way to handle our sprites into several animations. // of animated monster if you disabled the shadow. The collision part is handled via the hitPoint() and hitRadius() functions. The hit testing is done via circle which is a bit less accurate than a boxing mode. The logic of the player object is a bit different than the monsters. The x & y position are normally controlled by the user moving the character with the keyboard. 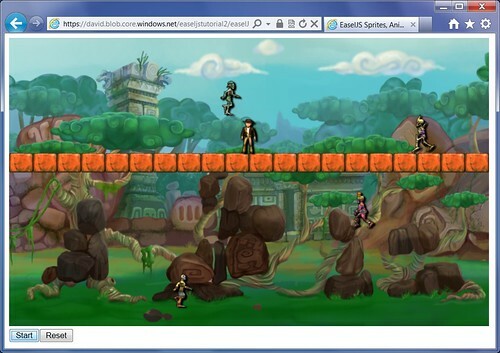 Our hero has more animations than the monsters as he can die, jump, move, celebrate and be in the idle mode. The player will be remotely controlled into the main page. Usually, the first step of a HTML5 game is to download all the needed resources before starting the game. In my case, you’ll find a very basic ContentManager available in the ContentManager.js file. Note: the CreateJS suite now expose a library named PreloadJS that is far more advanced that the basic method exposed below. It lacks several things to be a good content manager: a download progress indicator, a better error handler, localStorage usage, a more generic code, etc. But I’ve tried to build a basic & easy to understand game. Once done, the startGame() function is called. It first uses the CreateAndAddRandomBackground() function which create a random background based on 3 different layers. Then, it creates our Hero and set its Y position in a random place. Just under the hero, we’re building a very basic platform where our hero will be able to walk on to. Finally, we’re building 4 Monster() objects inside the Monsters array and we add them also to the stage. We’re just checking during each tick if one of the monsters is not currently hitting our hero based on their collision parameters. If one monster is too near of our hero, our poor hero must die. You can now play with the live sample just below. Every time you’ll press the start button a new background will be generated and each character (enemies & hero) will be placed at a different position. You can also move right or left using the keyboard. By the way, don’t panic. As you can’t jump, there is currently no way to win in this game. This is a 100% looser game (first of genre?). Note: as there is no progress bar, you need to wait a bit before playing after pressing the “Start” button. Next part will be to handle the jump sequence using a simple physics engine, loading the music & sound effects and finally loading the levels. But the core is here if you’d like to create your own simple game, you now have all the cards in your hand! EaselJS 0.4 can now use requestAnimationFrame for more efficient animations on supported browsers (like IE10+, Firefox 4.0+ & Chrome via the appropriate vendors’ prefixes). You have to explicitly call the tick() method of each object in a global handler rather than having a global Ticker automatically calling your tick implementation. Brilliant thanks! Can't wait for the next installment. Could you possibly explain this line a little more? It is just to save the original constructor of BitmapAnimation object to be able to call it later on. Otherwise, it would be overriden. For some reason the demo does not work on my iPad with iOS 5.1.1 (though some other EaselJS demos around the web does work). Any ideas? I've updated the turorials & samples to EaselJS 0.5. They should now work again on iPads. I don't play it. Do you give me code?